The Roofing Solutions team Hobart specialises in all forms of metal roofing, skylights, guttering, fascia, cladding and down pipes and provides quality advice on your roofing and re-roofing needs. Roofing Solutions Hobart is conveniently located at 4 Howard Road Glenorchy, Plenty, is a licensed plumbing firm and employs mostly its own tradesmen. We can supply, and/or supply and fit at the most competitive rates in Hobart. 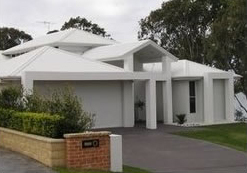 The company also does renovation work, specialising in the removal of old tiles and replacement with colorbond roofing. One key feature of the business for renovators is that Roofing Solutions is fully licensed to remove asbestos sheeting. The company performs jobs ranging in size from small jobs up to large jobs worth more than $100,000. The company works anywhere in Southern Tasmania from Oatlands to Bruny Island, from Orford to New Norfolk. The company is a member of HIA (No 532016), Master Plumbers (No 2899) and is also a member of the Master Roofers Association of Australia. For further information, contact directors Andrew Hannaford or Richard Scott on (03) 62736888 for an obligation free quote, or complete our convenient online enquiry form for prompt and friendly service.